As one plays a game many different measures of quality can be used to determine how one feels about the game. The story can be deep and engaging, the production can be top notch and engrossing, the gameplay can be varied and exciting. Unfortunately Fate/Extella: The Umbral Star is none of these things. However it is something just as important and perhaps more so for a game of this type, it is so much fun to play. Unlike other side stories in the franchise this particular entry is not stand alone, instead being a sequel to the RPG Fate/Extra released for the PSP in North America in 2011. Well before the massive increase in popularity the series would receive following the release of uFotable Fate/Zero anime. This is likely an issue for the vast majority of fans who might be interested in the game due to its connection to Fate/Zero or Fate/Stay Night. Whereby many such as myself have not played the predecessor, this leaves us in the dark as this game has very little connections to Fate/Stay Night or Fate/Zero save popular characters appearances. Luckily unlike Type Moons more well known titles, Fate/Extella does not lean too heavily on its story by virtue of it being a hack and slash Warriors clone. If you have played a Dynasty Warriors title previously you will know what to expect. While there are skits present to fill out each routes with side missions and paths the story is largely a perfunctory affair. Often played for laughs, fan service, or a mere excuse to make the action happen. An epic struggle for the Holy Grail this is not. It is for these reasons that I do not mind the limited amount of localization that was done for this release. As the Japanese only voice track is likely good enough for the people who may yet be interested in the title. Put simply this game revels in how anime it is, if you like that kind of stuff in your games you will feel right at home. If you are one of these players Fate/Extella is quite a good time and fun game. When one of the first enemies you meet in a title is a wannabee idol/devil girl, you know the title you are playing is not taking itself too seriously. This was an excellent design choice as when taken as an absurdist tale Fate/Extella succeeds at being its own amusing thing in its sprawling franchise. Originally staring Nero the “Red Saber” things already start off strangle, making one of the worst of the Roman Emperors a blonde haired bishoujo is just strange, even more then making King Arthur one. However making her a ditsy blonde haired bishoujo is just amazing. As while Nero looks like Artoria her personality cannot be more different from the much more reserved Saber we all know. Right from the start Nero’s bubbly personality fits the tenor of the game perfectly. 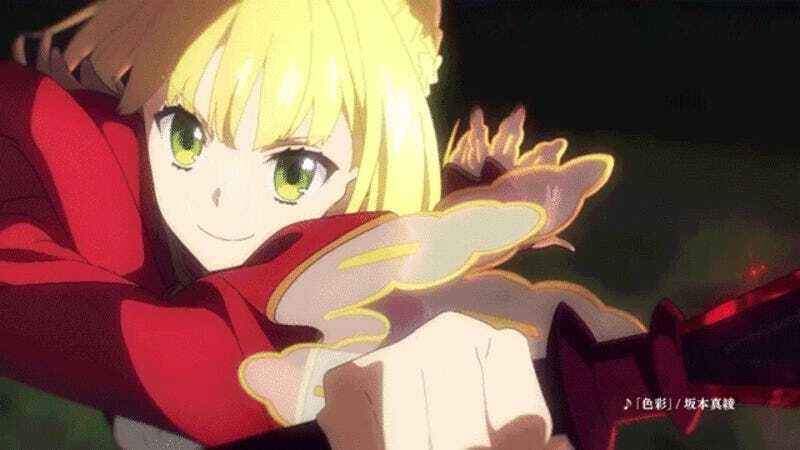 Even in game Nero shines brighter then other early characters as her magical girl transformation (yes there is magical girl transformations) is just so amazing it doesn’t get old. While Nero was not my favorite character to play as, her personality made her a surprisingly memorable companion to your more mute avatar. While Nero was not my favorite that honour goes to Lancer or more specifically Cú Chulainn, that is okay as there is variety present in the game. Based on his superior speed, agility, and combination attacks he plays to my strengths as a gamer. This is great as the game provides many different and unique Servants to play as. Each being surprisingly unique in terms of game play. The longer you play the more likely you will be to find a character that suits your style, which is quite different from lesser games in the genre. Finally though while the game is a product of its genre and limited by it in key ways such as repetitiveness. The game does not feel like a slog, in fact the action in the game is so satisfying it makes the story elements all the worse. Often I found myself wishing to put aside the boring plot lines so I could get to my glorious slaughter. As while the battle system is not what one would call complicated, it is streamlined and fast. Though some levels in later routes can drag on a bit too long as stages can last up to close to forty minutes or more. In the end if you are a fan of Type Moons Fate, enjoy Warrior clones, and have a decent tolerance for fan service Fate/Extella The Umbral Star may make a good addition to your library. In many ways it is the B Movie of the video game industry knowingly corny, unpetencious, but all the same surprisingly fun. It will win no Game of the Year awards however there are far worse things in the world to spend ones time with.